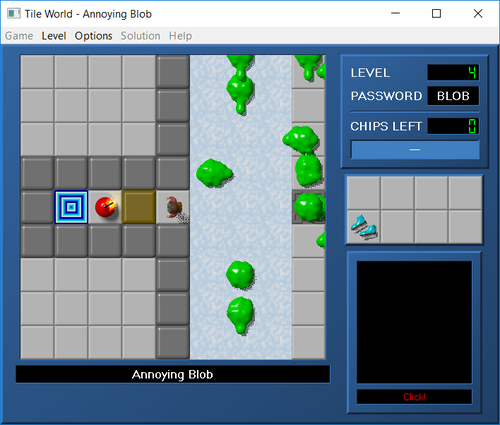 M11k4's Content - CC Zone: The Next Level - Chip's Challenge/Tile World website! Here are some levels inspired by CCLP3 that were made for the October 2018 Mini Create Competition. The concept was to "make about a 9x9 (or a shape that is as small as appropriate for the level) version of a level in CCLP3." Here are the two levels used for the January 2019 Time Trial. Here are the levels submitted to the October 2018 Create Competition - Simple as CCLP3. This first version does not contain designer information, so you can form your opinions on the levels before that and the results are revealed. We had about seven people make a total of about twenty levels. They are ordered in this set according to the order of their inspirations in CCLP3. Thanks to all participants! Thanks for playing too! Be sure to share your takes on the levels! This is CCLP2 modified for Lynx by the community. The beta version of this set was released last year, and here is a game play update that should be final. There are still plans for including better documentation but no more changes to levels are planned. Included here in the zip is a rough ccx file and dac file and short readme, but you can also download just the set itself. Thanks to all the people who made this possible! Check out the thread for more details, like list of levels and designers. This set collects all the levels used for Time Trials. It was initially compiled by Tom Patten, but now kept up to date by Miika Toukola. New levels will be added in here for your convenience. This set is also included in the Goodie Bag, though that version might not always be quite as recent as this one. You can also get a ccx file for this set in that release. When the Fireballs take over, how long can you survive? When the Blocks go crazy, how long can you survive? When your fortress is overrun, how long can you survive? 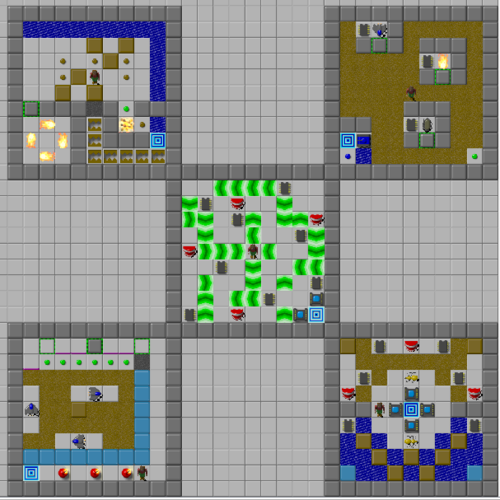 This set contains the Survival levels that have been used for competitions. Warning! This set is not for the light-hearted. 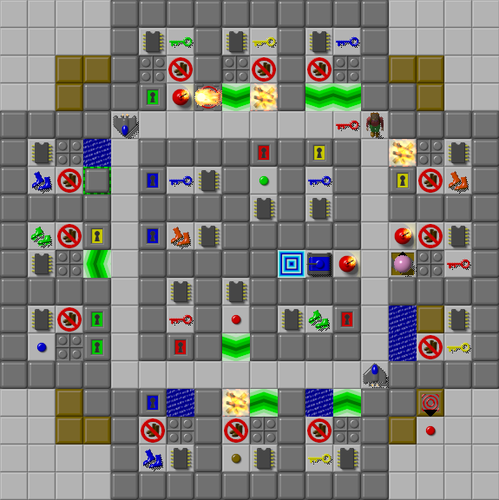 The objective in each level is to survive without dying or possibly cooking the level. For the sake of your mental health, it is not actually recommended that you even attempt these levels. You can find more information on the competitions in their respective threads in the competitions sub-forum. A great big thank you to Lessinath for coming up with so many of these levels! I would say 'enjoy', but with this set it's more appropriate to wish you well! Here are two levels for you to compete with, and a bonus level that shows the inspiration for the first level. This time we are primarily competing in MS, but your Lynx solutions are always welcome as well! For more details on the competition, check out its thread. This set was compiled from the submissions to the April 2017 Create Competition. Participants were provided by a template of five rooms to build upon. Levels #2 - #7 combine rooms from different designers into new creations. #2 - Esteemed Entanglements - these are some of my favorite rooms combined. #3 - Desiccated Depository - more great rooms put together. #4 - Awesome Amalgamation - these rooms in turn were a bit simpler in concept. #5 - Fused Furnishings - after the other rooms were spoken for, these were left to be used. #6 - Calculated Conglomeration - these rooms were perhaps the trickiest ones. #7 - Backbreaking Bananas - while these might still be the hardest ones. Levels #8 - #13 are each made by one designer. The individual rooms are repeats from above. Levels #15 - #47 are the rooms separately. You can thus practice them or build your own combinations. Levels #49 - #53 are the templates that can be used to build completely new rooms. Thanks to all who made something for this set! Check out the thread for more details on the competition and set. All feedback is appreciated. You can even make your own challenges and combinations of rooms and still send them to me for a possible future release. Here are two levels for you to compete with, and a bonus level that shows the inspiration for the second level. This time we are primarily competing in Lynx, but your MS solutions will be interesting to see as well. The levels for the April 2017 Time Trial. Also, the templates for the April 2017 Create Competition are included in this file (levels #7-11). Check the competitions subforum for threads on both these competitions! UPDATE: the final room in the first level proved to be too annoying, so the update removed two of the pink balls there from the monster list. Previous solutions should not be affected, nor anything in Lynx, but now in MS the level is slightly more reasonable. The levels submitted for the February 2017 Create Competition - Walls of CCLP1. Thanks to everyone who submitted their creations! This set contains all the levels submitted to the December 2016 Create Competition - Movie Madness. Thanks for participating! Find more info on the competition in its own thread. The plan is to eventually include all these levels and ones from similar sets in the Competition Goodie Bag. Keep your eyes open! Two levels by Ihavenoname248 for the March 2017 Time Trial. Encased, Just in Case - chips are all along a maze, but what's the fastest way to pick them up, particularly considering you can talk short cuts through the walls? Deflection Field - find a dozen chips, dodge some balls, and make your way to the Exit. For further details on the competition itself, check out its thread. Here are the levels for the February 2017 Time Trial. Check the thread for more details, as they come available. Hope you enjoy! The levels for the December 2016 Time Trial, by Ihavenoname248. Check the thread for details! Welcome to the May 2016 Time Trial! Play them, send your solutions, and wait for the results. More info here. Can you steal the Cross of Coronado and get away with it? However, this artifact comes with a curse and there is a twist! but better get to it before the train passes by without you! For more information, check out the actual thread! These are the levels from the February 2016 Create Competition. The levels are based on the wall arrangements from CCLP3. Thanks to all the participants! Here are the levels submitted to the December 2015 Create Competition - First Impressions. Thanks to all participants! Check the thread for more the results and other details, including a long video of how we got this ranking. Welcome to enjoy the pain that is funfair0! This set contains 25 (plus one) new levels and a bunch of bonus levels that I've made for CC Zone over the years. I do not recommend this to be played in order and blind, so sneak a preview in the editor to pick which level you might like to try. I'm pretty sure there is something here for everyone, though I think not all the levels are for everyone. There are many levels with pop-up walls. There are some mazes. There are lots of puzzles. 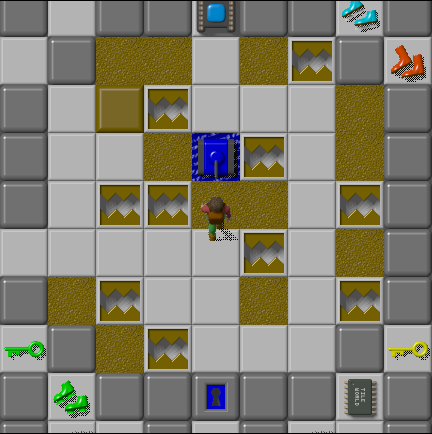 All the main levels work in both MS and Lynx, though sometimes with different solutions. I also enjoy sequels, so there are a couple in here and more in the works. I love to hear any feedback and reactions to the levels. Thank you in advance! I usually thank all participants for the submissions, but this time I really want to thank you from deep within for helping me make something special for my daughter. THANK YOU! Update: now added the next two years worth of competition levels too! I didn't do the exact calculations like above, but there are 74 new Create levels and about 20 new Time Trial levels as well. Thanks to all the people who created these levels! They are an important part of CC-history. This compilation will be updated when needed. Like if you want to comment on one of your designs included in this release, it can be added into the ccx file. You can also expect us to add more files to the collection once there is enough material. All feedback is appreciated.